It is a period of civil war. Rebel samurai, striking from a hidden base, have won a terrible victory over the House of Akizuki. The clan elders make their doomed last stand, leaving one bold general (Abe) and the fugitive Princess Yuki (Nagasawa) to flee to safety with the clan’s treasure… their only hope. Akira Kurosawa’s 1958 samurai epic Hidden Fortress broke with tradition by telling its story not through the eyes of the aristocratic leads, but their bumbling servants. Shinji Higuchi, director of this 2008 remake, is no Kurosawa, but that’s hardly his fault, particularly when working with the low expectations of modern Japanese movies. He gets to work in colour, but seemingly without proper lighting on location, leaving most scenes in washed-out pastel shades. His leading man, the rakish Takezo (Matsumoto) is played by yet another refugee from a forgettable boy-band, glued unconvincingly to a merkin of a beard. His feisty princess is a starlet who thinks acting means scowling. The talented Hiroshi Abe does his best to recall the tough-guy gravity of the original’s Toshiro Mifune, but loses all his deep pauses to camera-shake and fast cutting. It’s only among the baddies that proper actors get to shine, particularly the hypnotic Masahiro Takashima as arrogant border guard Kyunoshin, who loses interest in molesting Princess Yuki when he discovers she is a girl. 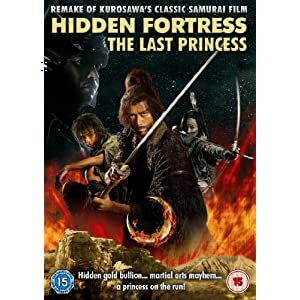 A minor film in the Kurosawa canon, the original Hidden Fortress is mainly remembered today for the inspiration it lent to Star Wars. Director Higuchi, also the director of the controversial Lorelei and the overblown Sinking of Japan, is one of the founders of the same Gainax anime studio that brought us Evangelion, and a proud member of that generation of fanboys drawn to Hidden Fortress solely on the recommendation of George Lucas. Consequently, he approaches his remake as if playing a Star Wars drinking game… which, to be fair, is what everybody else has done since 1977. Frame-wipe editing throughout recalls that to be found in both movies. A drop-shaft mine escape is shot from above, slyly recalling the canyon assault on the Death Star. In the hands of sometime anime writer Kazuki Nakashima, we get a hokey subplot about poisonous mine gas, and a timid refusal to grapple with the implications of class (happy stupid peasants, troubled smart samurai, and never the twain shall meet) but also a plot-driven series of action encounters, as our heroes duck imperial entanglements, drop in on an Ewokesque forest festival, and ultimately descend into the titular base to rescue the princess. The appearance of the dastardly Lord Takayama (Shina), a black-clad samurai who hides his scarred face with a mask, lingers tauntingly on a tableau that echoes Darth Vader’s first entrance aboard the rebel blockade runner. Meanwhile, a leitmotif born from John Williams’ “Force” theme runs throughout Naoki Sato’s score. The result is a curious contradiction – a throwaway samurai B-movie that proves oddly compelling to the Star Wars fan. This article first appeared in the SFX Total Anime Special #3, 2010.